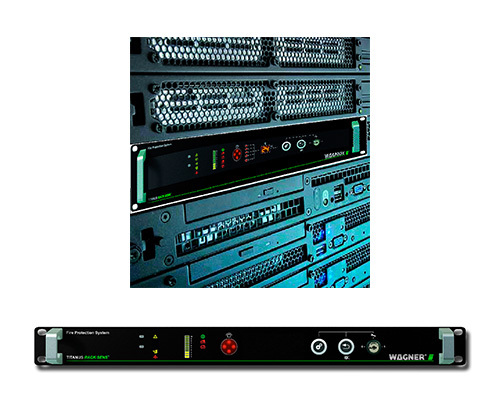 TITANUS RACK·SENS® modular systems fire protection for the control of electronic cabinets of 19 inch format. The system meets the highest requirements regarding security in the IT sector and for the first time, it provides the advantages of the improved TITANUS systems for smoke detection by air sampling, for the control of 19″ equipment. 19″ module / 1HU for earliest possible detection of fires. 19″ module / 2 HU for earliest possible detection of fires with fire extinguishing integrated. Its many different versions and extension accessories allow for its individual adaptation to customer’s requirements. 6 frontal Leds indicating the status: service, disconnection, shot, pre-alarm, alarm and fault. Relays free of output voltage for alarm and fault. Optional 10-digit bar graph that keeps the user informed about the current smoke level.